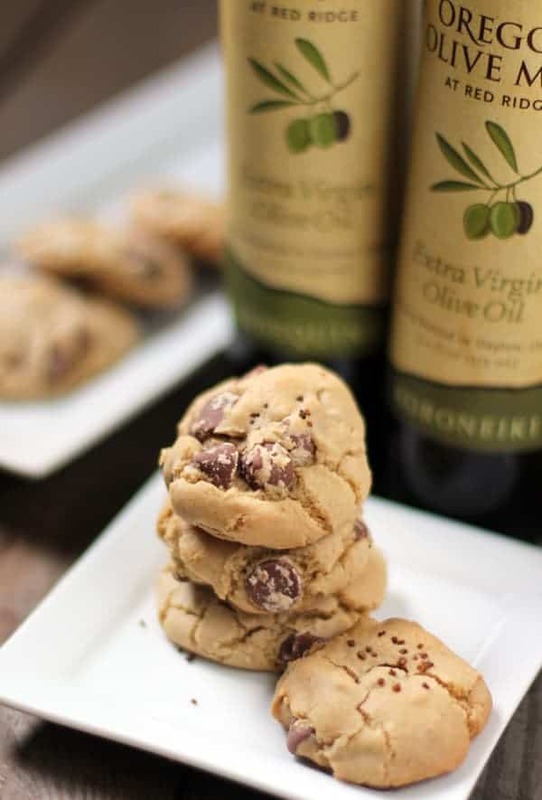 These Extra Virgin Olive Oil Chocolate Chip cookies are made with olive oil instead of butter, and taste rich and incredible. You won’t even know they’re butter-free! Chewy, chocolaty, indulgent, delicious, and entirely butter free. These came out exactly how I remembered them the first (and second) time I had them at the Oregon Olive Mill at Red Ridge Farms. I noticed a slight difference between the cookies I had at Red Ridge Farms (photo above left) and the ones I made. I’m pretty sure it’s because I rolled mine into a ball and let them cook that way. I’m thinking they pressed the dough down a bit before cooking. Either way they are delicious and you get this lovely rich and fresh olive oil flavor with each bite. This is a surefire way to impress your friends this holiday season. 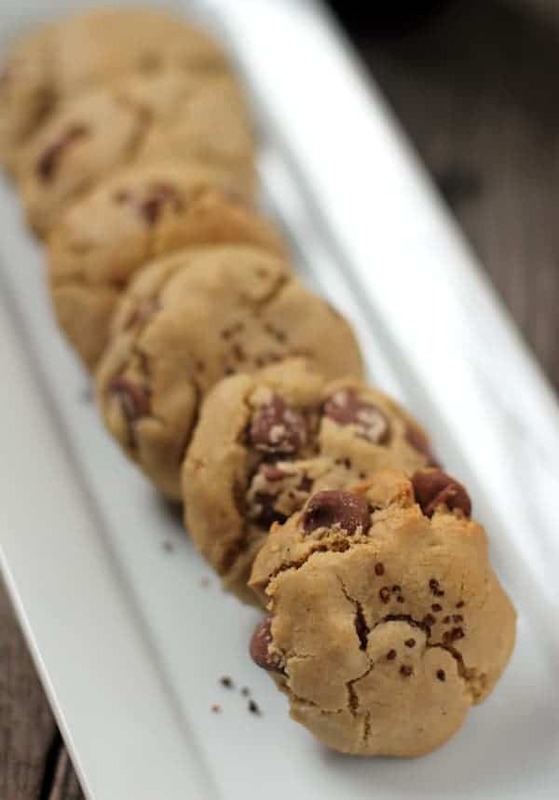 Instead of the same ol’ generic chocolate chip cookie made with oodles of butter, try this recipe made with extra virgin olive oil instead of butter. And I’m no nutritionist, but I’m fairly certain that the health properties of extra virgin olive oil outweigh that of butter. Just sayin’. 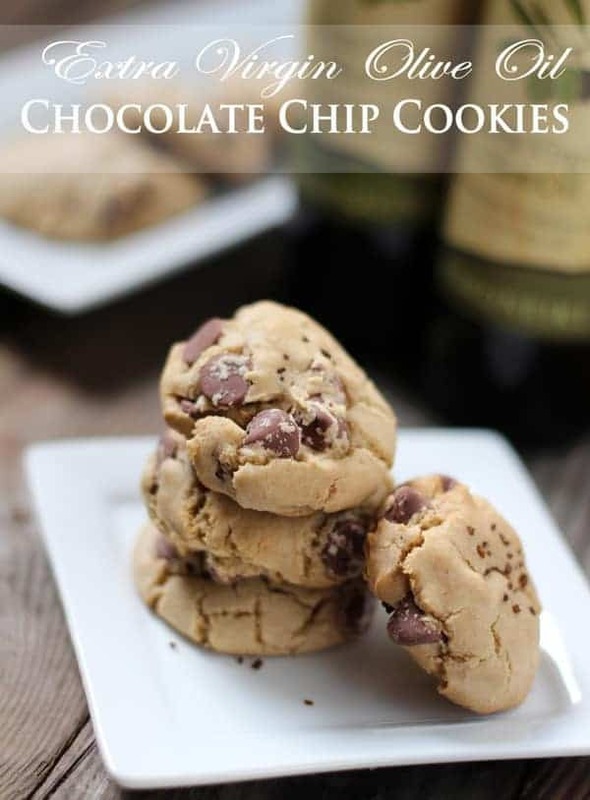 A delicious alternative to traditional chocolate chip cookies, made with extra virgin olive oil instead of butter. Recipe provided by Libby Crow, Olive Oil Program Ambassador at the Oregon Olive Mill (adapted from Cook’s Illustrated Thick & Chewy Chocolate Chip Cookie Recipe). (optional) Add a pinch of Espresso Brava Salt or other fleur de sel salts. I decided to take these cookies up another notch by topping them with some Espresso Brava Salts (purchased at Red Ridge Farms) before baking. The flavorful salty bite gives the cookies just one more ounce of “wow” factor. This particular salt isn’t necessary to give it a salty bite. Try any ol’ fleur de sel or other finishing salt. Thank you Libby Crow for sharing such a delicious recipe and great use for extra virgin olive oil! For more ideas for using extra virgin olive oil check out this post. Any chocolate chip cookie is any instant winner in my book – these look so delicious and I am definitely craving one to devour right now! Thanks Thalia! 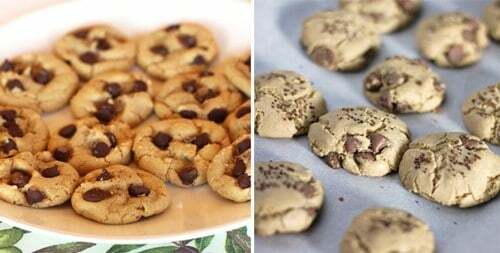 I agree, chocolate chip cookies (any and all types) are just the best!! Ooh, I must try these. I can never resist a new chocolate chip cookie recipe…especially one that looks as good as this! I made these this weekend exactly as directed and they are AWESOME!!! Thanks so much for the amazing recipe! A friend was in Greece and brought me some extra virgin olive oil, aromatized with chocolate, and I used it in these cookies. They were absolutely delicious! There was only one kind of strange thing that happened with them. I use a silicon mat for baking and I’ve never had anything stick to it. But these cookies did. It took quite some effort to get them off in one piece. Do you maybe have any idea why that happened? Ohh awesome! I hope you loved it! Hello! I have made these several times and each time the batter is quite dry and crumbly. I have to add about a tablespoon of water to make it hold together. Any suggestions on what could I be doing wrong? Thanks in advance! PS– my family LOVES this recipe. Thank you so much for posting! Thank you!! I hope to get back to you soon with more feedback. I’m going to try to play around with them again this weekend to see if I can recreate your results to see what could be the issue. Hi Diana, Thanks so much for the feedback! I’ve made these a several times and have not experienced the crumbliness you’re experiencing. But I did reach out to Libby, who created this recipe, to get her feedback. I’m sure she could offer some insight, since she’s made them dozens of times. My initial thought could be on the actual oil you used. What kind did you use? And how old is it? The properties of olive oil start to break down after a year (that’s why it’s best to consume it within a year). I always have used fresh olive oil when I’ve made them. Or, perhaps you just might need more moisture. If your egg is small it could effect the overall moisture too. So right now (without hearing back from Libby), my recommendation would be to add a little more oil, or more egg (perhaps like you were doing with the water, just a tablespoon of egg or oil at a time), until the dough feels a little more moist. Just work with it with your hands and get a good feel for it. Also, what are you baking it on? I always use parchment paper and have had good results. But if you look at the comments before you, someone uses silicon and the cookies stuck to the pan. As soon as I hear back from Libby I’ll give you her feedback too!! I hope this helps for now. Made it today since it was storming outside and its DELICIOUS Nobody in my house is complaing. No butter…. It’s okay the olive oil worked wonders! Wish i could post a pic!! !Thanks so much. 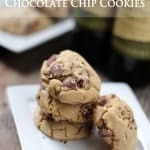 I plan on making this with cannabis infused olive oil, I already know the recipe for these cookies is going to be the best thing I’ve ever utilized on the internet. So for that I thank you. Oh my that sounds very interesting, would love to hear how they turned out! I just had chocolate chip cookies made with olive oil at The Mill, a restaurant in Reggello, Italy. They were fantastic!! I was really worried about the dough– it was so oily! I only put 4 cookies in at first because I was certain they weren’t going to come out right… I was wrong! They came out great! When I make them again, I may add a little more flour.